I’ve been experimenting with graphic recording for about five months now. I still feel like a complete novice, but I do see some improvement when I compare recent work to some of the first sketches that I posted on this site. That improvement is due in part to the constant variation in the medium in which I work. It is that variation that I would like to talk about today. Disclaimer: some of the links below are affiliate links that help support the mission of this site. 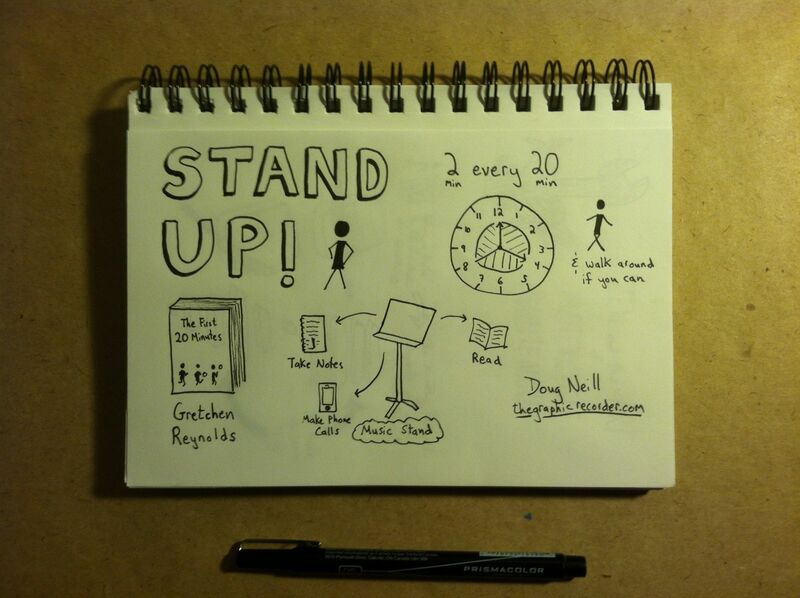 When I first started sketchnoting, I had just one 5.5 inch x 8.5 inch sketchbook. This size made it easy to throw in my backpack so that I could pull it out throughout the day. That notebook served my purposes well, and I continued to use it today, but it didn’t take long for me to feel constrained by the size: I didn’t have the space to get down on one page as many ideas as I wanted. So I went big – poster big. I used the change in medium as an opportunity to try a different recording technique: real-time graphic recording. I figured that I would need the extra space to deal with my sloppy recording of ideas. My first attempt was indeed a bit unorganized, but the second was much cleaner. The large amount of space was liberating. I enjoyed the larger size of the poster paper so much that I decided to pick up a larger sketchbook – this time a notebook of size 11 inches x 8.5 inches. The same freedom that I felt with poster paper accompanied my first sketches with this new book. 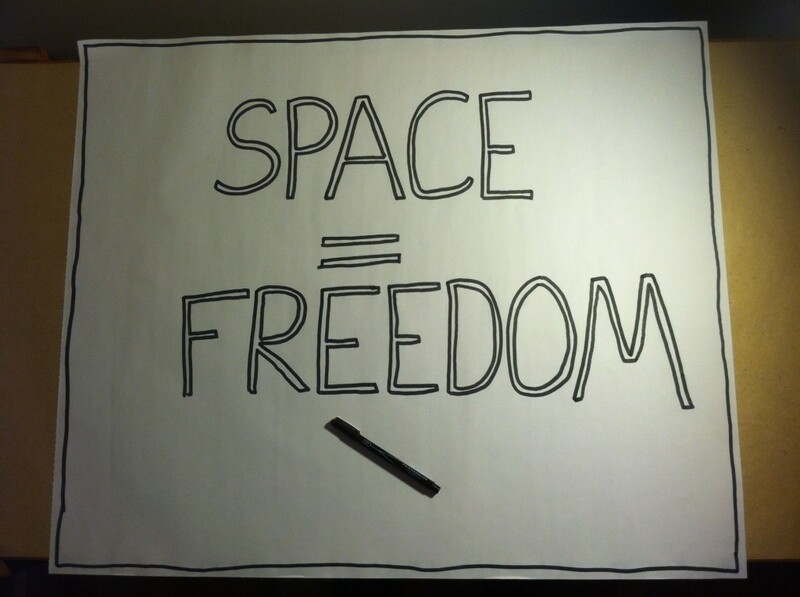 I’ve found that this size is ideal for sketchnoting an article or a chapter of a book. 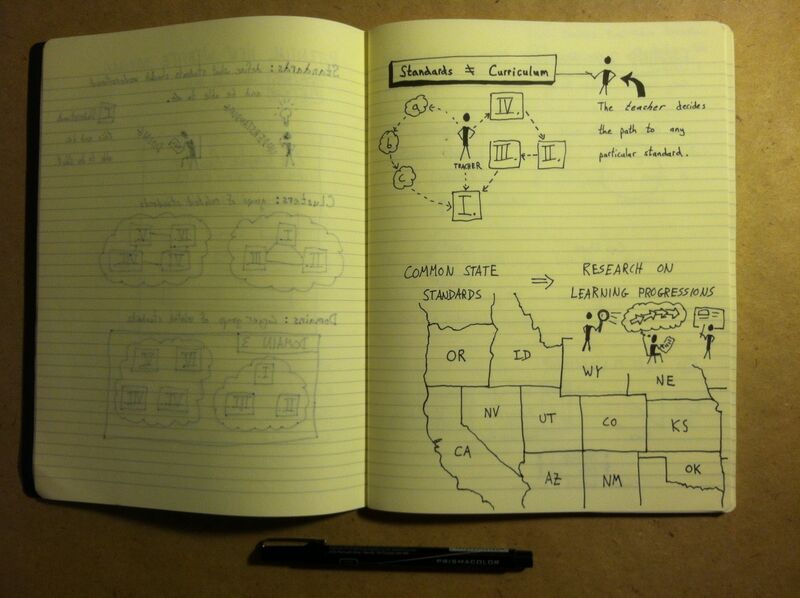 I have also used this size to to take sketchnotes during conferences and public talks in Portland. After those experiments in larger-scale graphic recording, I went small – all the way down to a pocket-sized moleskin notebook. 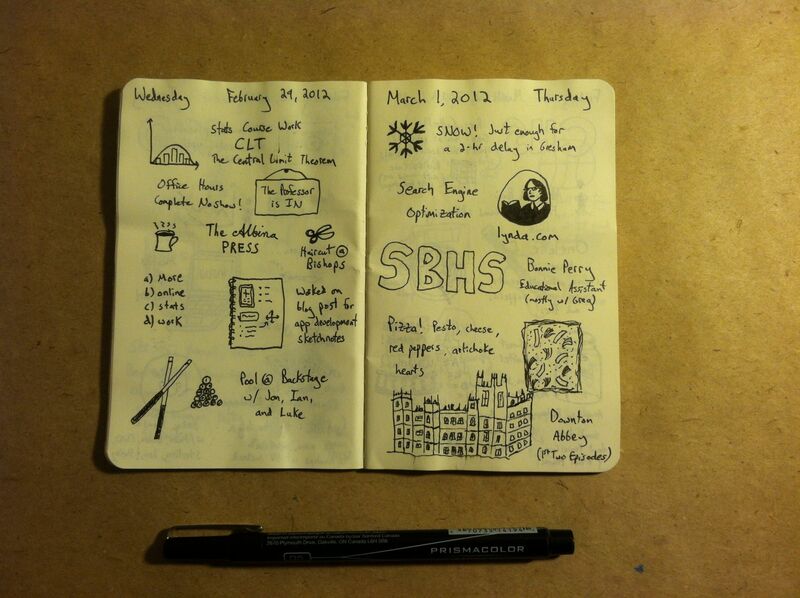 I use that moleskin to keep a visual logbook of what takes place in my day to day life. This tiny notebook is the perfect size to carry with you wherever you go and record the day’s highlights during any downtime. I cannot claim that I came up with the idea for a visual logbook on my own – I stole it from master thief Austin Kleon. The next idea that I stole came from Jessica Hagy and her project Indexed. 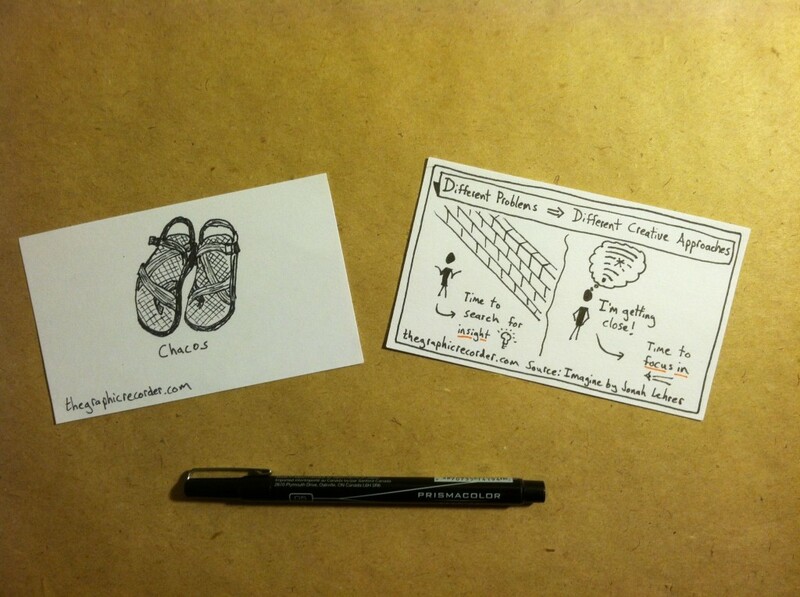 When I first came across that project I had been looking for a way to create smaller pieces of work on a more regular basis, and 3×5 note cards seemed to be a good way to do that. So the Visual Vocabulary project was born, for which I post daily sketches of a word or phrase. This smaller medium also spawned One Card One Concept a few days after that. In that project I pull out individual ideas and put just one concept on each card. With this smaller medium there is less pressure – you can focus in on one thing at a time. It also makes it easier to go through iterations without losing your momentum. Each medium that I have discussed so far has one major constraint – page size. 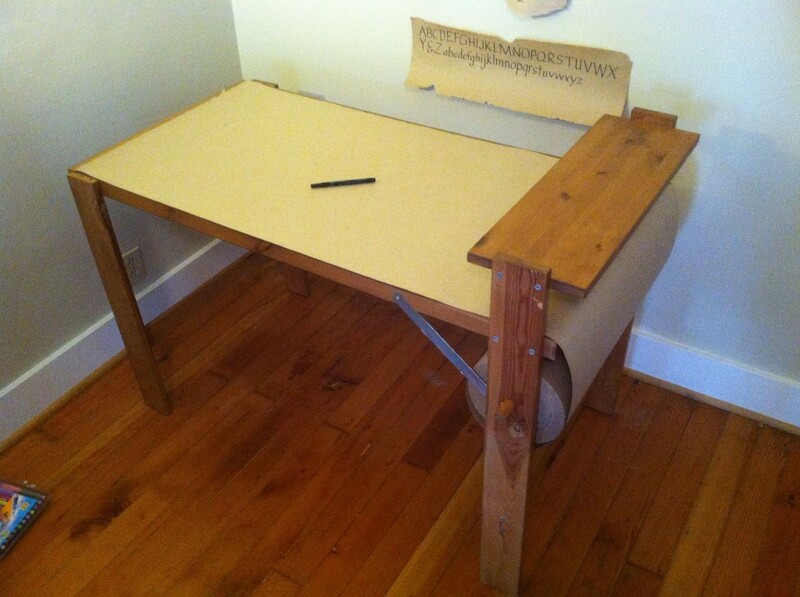 Even large poster paper has a finite amount of space within which to work. By pure luck I came across a piece of equipment that removes that constraint: a drawing table with a spool of construction paper that you can unwind to meet the size demands of any sketch. I enjoy using this table when sketching longer podcasts (one of my favorites to sketchnote is Radiolab). The beauty is that with this table I never have to worry about running out of space. Recently I have begun focusing more on my handwritten typography skills. To aid in the development of those skills, I picked up a lined Moleskin notebook. I initially thought that the lines would restrict my ability to think non-linearly, but I have found it surprisingly easy to ignore the lines when sketching. When writing, the lines keep my hand on track as I develop the muscle memory to be able to produce clean type even without those aids. 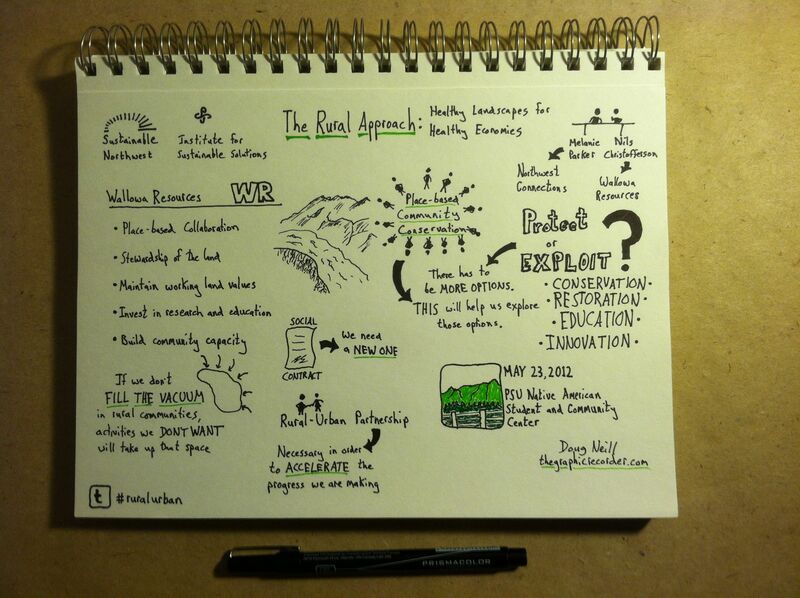 One medium that I have not yet entered is that of digital graphic recording. Though I do own an iPad as well as a tablet that connects to my computer, I currently am not using either of those tools for sketchnoting. The reason for resisting that transition is that I enjoy working by hand too much. The feel of putting pen to paper is just too enjoyable. I imagine that before long I will start incorporating digital tools in my work, but for now I am enjoying the old-school approach. I also like keeping it simple Michael Nobbs style so that I can work from anywhere. The largest benefit of varying the medium in the ways that I have described in this article is that in each case you are exposed to different creative constraints, which force you to use your skills in new ways and address challenges that you haven’t been exposed to before. When you do this your brain learns to work in new ways – which is both enjoyable in the moment and leads to long-term growth. For this reason I plan on continuing to seek out new mediums whenever I get the chance. If you work with other mediums that were not mentioned in this article and want to share your experience, feel free to add a comment below!